It has been a whole year since I have shared any of Liam's favorite things, so a little round up post was due. I can honestly say that Liam loves each and every one of these things! We spend much of our days out of the house, even in winter, so we don't have an overload of toys by any means. I only like to keep things around that I know will get played with frequently. Liam's imagination is really developing, so I love that many of these items help facilitate plenty of play. Plus they are all Finn friendly too, except for the gondola... He likes to yank if right off its track whenever he gets within reaching distance and there are some tiny choking hazards too. Some of the highlights: The trolley makes the most adorable ding. The Magnatab (#3) is perfect for long car trips or airplane rides. I'm currently eyeing the alphabet versions as well to help Liam with his letters (lower case & upper case). The automobox (#6) completely comes apart and can be interchanged with different vehicles. And I just happen to love that the icecream set is aesthetically pleasing! What are your three year olds loving lately? My eye was instantly drawn to that ice cream set (girl mom much? Haha) That trolley reminds me of Mister Roger's neighborhood, so cute! I love all of these toys!! I was having some issues clicking onto the links because the pin it button kept popping up. Sophie's not three, but she would love some of these toys. She has a toy towing truck and cars. Noah got an automobox for Christmas from one of his many great aunts and we all love it! Right away Chris wanted to order more but I told him I think one is enough. I think that's our problem with toys... If Noah likes something we could multiple versions which isn't necessary. I've thought about purchasing that ice cream kit or I think there's a pizza one too. I like the ice cream though. This might have to be a future purchase! That ice cream set is so cute! I know a certain someone who would love it! 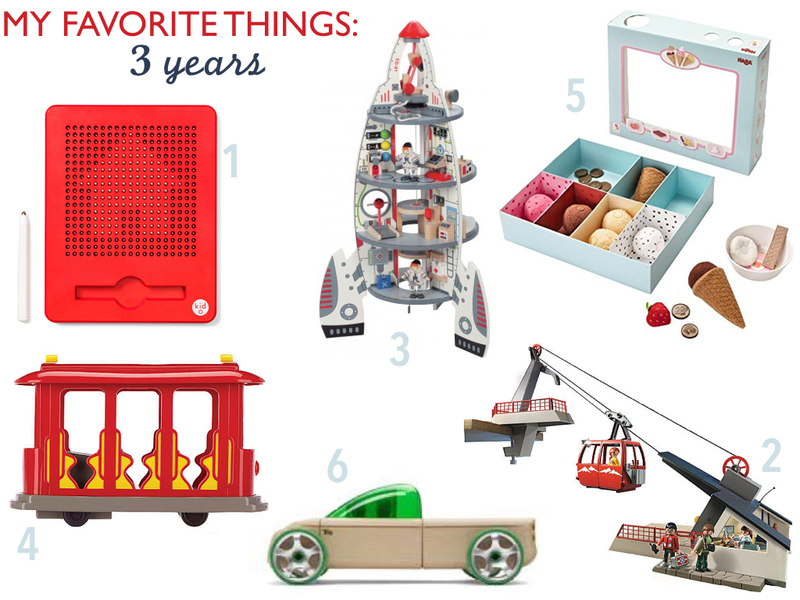 Such adorable kids things, love the trolley! oh that ice cream is adorable, and I love that alphabet magnet thing! We have the basic red one but I didn't know they had the abcs too. fun. oooh the automobox is super cool! my friend's little boy just turned 3 and loves all things cars and trucks so i will definitely be grabbing that for him. What fun stuff!! We don't have any of these - I think Cam needs that truck! Does Liam know how to write his name? Cam won't even try past the C, so I'm wondering if practicing his letters on the magnet toy would help. Thanks for the suggestions! These are great! I'm just going to chime in with everyone else and say how cute that ice cream set is. I may need to get one for Mila. Love! That automobox! How cool is that thing? Right now we're all about sports. Soccer. Football. Baseball. You name it we're playing it these days. That automobox is so cool! I've never heard of or seen that before. Definitely might need to look into that for Mason! We have a few of the automobox vehicles too and love them! They are so awesome!!! OMG that spaceship is so cute! !